V.Ganapathy is a consultant on Boilers/HRSGs from Chennai. He has over 40 years of experience in the engineering of steam generators and waste heat boilers with emphasis on thermal design, performance and heat transfer aspects. He also develops custom software on Boiler Design and Performance and conducts special courses on Boilers/HRSGs. He holds a Bachelor’s degree in Mechanical Engineering from I.I.T.Madras and a Msc(engg) degree from Madras University. 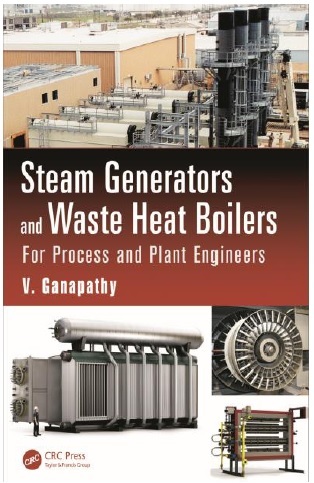 Ganapathy has published over 250 articles on boilers and also has authored 5 books on Boilers,the latest being, ”Industrial Boilers and HRSGs”. He has contributed several chapters to the “Handbook of Engineering Calculations”(McGraw Hill) and Encyclopedia of Chemical Processing and Design. His new book,"Steam Generators and Waste Heat Boilers for Process and Plant engineers" will be out in Oct 2014.